Ht / Wt: 6'2" / 236 lb. 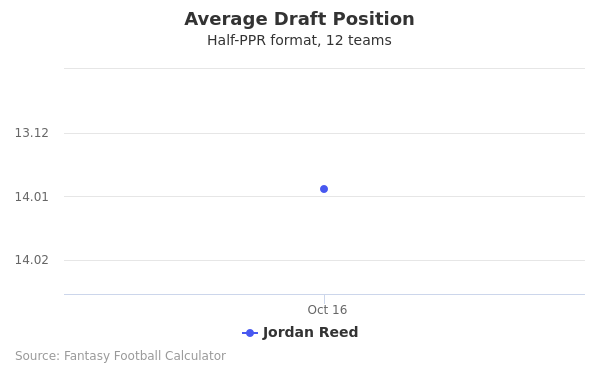 Jordan Reed's fantasy value is measured by his average draft position (ADP) in fantasy football mock drafts. 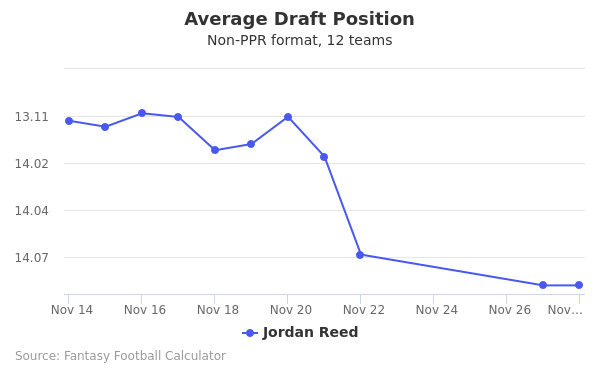 In recent drafts, Reed's current ADP is 14.06, which indicates that his fantasy outlook is to be the 6th pick of the 14th round, and 161st selection overall. 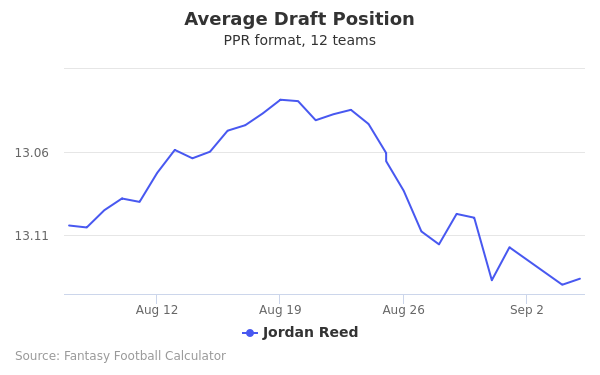 The code below will display a graph that updates every day to show the ADP data for Jordan Reed for the past 30 days in 12-team PPR leagues. Draft Giovani Bernard or Jordan Reed? Draft Jordan Reed or New England Defense? Draft Derek Carr or Jordan Reed? Draft Chris Herndon IV or Jordan Reed? Draft Jordan Reed or Quincy Enunwa? Draft Jordan Reed or Marquez Valdes-Scantling? Draft Jordan Reed or Matthew Stafford? Draft Jordan Reed or Nick Foles? Draft Jack Doyle or Jordan Reed? Draft Jordan Reed or Nelson Agholor? Draft Jalen Richard or Jordan Reed? Draft AJ Brown or Jordan Reed? Draft Damien Harris or Jordan Reed? Draft Jordan Reed or Sam Darnold? Draft Jordan Reed or Philadelphia Defense? Draft Jordan Reed or Noah Fant? Draft Jordan Reed or Robbie Gould? Draft Adam Vinatieri or Jordan Reed? Draft Jamison Crowder or Jordan Reed? Draft Indianapolis Defense or Jordan Reed? Draft Buffalo Defense or Jordan Reed? Draft Brett Maher or Jordan Reed? Draft Jordan Reed or Seattle Defense? Draft Jordan Reed or Matt Prater? Draft Jordan Reed or New Orleans Defense? Start Giovani Bernard or Jordan Reed? Start Jordan Reed or New England Defense? Start Derek Carr or Jordan Reed? Start Chris Herndon IV or Jordan Reed? Start Jordan Reed or Quincy Enunwa? Start Jordan Reed or Marquez Valdes-Scantling? Start Jordan Reed or Matthew Stafford? Start Jordan Reed or Nick Foles? Start Jack Doyle or Jordan Reed? Start Jordan Reed or Nelson Agholor? Start Jalen Richard or Jordan Reed? Start AJ Brown or Jordan Reed? Start Damien Harris or Jordan Reed? Start Jordan Reed or Sam Darnold? Start Jordan Reed or Philadelphia Defense? Start Jordan Reed or Noah Fant? Start Jordan Reed or Robbie Gould? Start Adam Vinatieri or Jordan Reed? 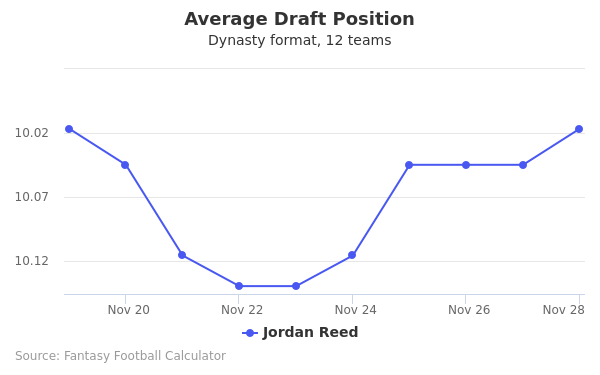 Start Jamison Crowder or Jordan Reed? Start Indianapolis Defense or Jordan Reed? Start Buffalo Defense or Jordan Reed? Start Brett Maher or Jordan Reed? Start Jordan Reed or Seattle Defense? Start Jordan Reed or Matt Prater? Start Jordan Reed or New Orleans Defense? Jordan Reed was born on 3rd July 1990, in New Britain, Connecticut. Jordan accredits much of his drive to his brother, who also plays for the NFL. He attended New London High school in New London where he left some admirable records. Jordan led the New London High School team in 2007 to an undefeated regular season. As a junior, he completed 122 of 222 passes for 1,706 yards for a total of 38 touchdowns. He was given a four-star scout rating and was ranked as the 10th best dual-threat quarterback countrywide according to Rivals.com. Reed accepted a scholarship to the University of Florida. During that time, he played for Coach Will Muschamp and Coach Urban Meyer’s Florida Gators football teams between 2009 and 2012. Originally, Reed had been recruited as a quarterback. However, he did not appear in any game, and he was redshirted in 2009. After that season, he shifted to the tight end position. He finished his career in college with six touchdowns, and 78 receptions for 938 yards. He decided that he would forgo his final season in college and entered the NFL Draft at the end of the 2012 season. His college highlights video can be viewed online. At the 2013 NFL Draft combine, the Washington Redskins selected him in the third round as the 85th pick. During the pick, his 40 time was 4.72 seconds. He also has a good vertical leap. On May 24, 2013, Reed was officially signed to a four-year rookie contract by the Washington Redskins. He weighed 236 pounds at the time and his height was recorded at 6’ 2”. Here is a link to his full draft profile. Reed recorded his first career touchdown on September 15, 2013, against the Green Bay Packers. It was the first time a Redskins rookie had scored a touchdown in their first two career games since Chris Cooley retired in 2004. On October 20 of the same year, he recorded a career-high nine receptions for career high 134 yards. He also recorded a touchdown against the Chicago Bears. With that, he managed to set a new record for receiving yards by a Redskins rookie. In spite of playing only nine games and four starts, he was named in the Pro Football Writers of America all-rookie team. Reed was sidelined after suffering a hamstring injury until week 6. On October 12 of that season in a game against the Arizona Cardinals, he caught eight passes for 92 yards. On November 16 he suffered another hamstring, which saw him sat out of week 12’s game. He was back on November 30 against the Indianapolis Colts where he caught nine passes for 123 yards. He caught seven passes for 63 yards against the Miami Dolphins at the start of the season. On October 25, he caught a career-high two touchdowns against the Tampa Bay Buccaneers and caught a career-high 11 passes for 72 yards. He caught two more touchdowns on November 15 against the New Orleans Saints. He went on to finish the season with 11 touchdowns, and 87 receptions for 952 yards. His effort saw him ranked 77th on the NFL’s top 100 player’s list of that season. In 2016, he signed a five-year contract extension worth $50 million. The contract also entails an average annual salary of $9,350,000. On October 2 of that season, he caught nine passes for 73 yards and two touchdowns against the Cleveland Browns. It was the fifth time he had scored two touchdowns in a game in his career. He also set the record as the fastest tight end in NFL history to reach 200 receptions. Towards the end of the season, he was named to the 2017 Pro Bowl roster, which was his first nomination to the roster. He finished the season with 66 receptions for 686 yards. Here is a highlights video of his 2016 season. He is the younger brother of David Reed, who is a wide receiver in the NFL. David was drafted in the fifth round of the 2010 NFL Draft by the Baltimore Ravens. His twitter handle is @Real_JordanReed. His Instagram handle is @jordanreed_86. For his jersey and autograph sales, go to this site here. He wears jersey number 86 for the Redskins and has a current Madden 17 rating of 89.